This year’s Strata + Hadoop World in New York City was all about “Making Data Work.” The key word: “Work,” which epitomized Strata 2015’s pronounced “business-y” tone. Perhaps it has something to do with location (New York compared to say, “perhaps-slightly-more-distanced-from-enterprise-reality” locales like Silicon Valley or Las Vegas), but the focus more likely represents a maturation in the Big Data space. From the exhibit floor to the lecture halls, Strata 2015 signified a shift from the conceptual to the practical. That was exemplified by this year’s presentations—plenty of strategic, but many corporate, including experiential Big Data story-telling from F1000 titans like Walmart, Netflix, and Lockheed Martin. Spend time on the show floor, and you’ll come away with a poetry textbook of slogans. Some of note: “Big Data…without all the swearing” (Altiscale), “Crush the Stack” (Arcadia Data), “We serve it up hot” (SAS—coffee theme, get it?). Big Data = Big Fun, in a geeky way. The Strata “Game Hub” area featured an air hockey table, foosball table, pool table, and—I am not making this up—8-bit arcade video games. (Hey—Pac Man. All righty.) There was even a climbing wall. (Big Data engineers scaling a fake indoor mountain? Can’t see any legal or insurance risk there.) Whenever a climber summited (and that was pretty much every climber), he or she would hit a button that sounded an ear-piercing bell that echoed through the entire pavilion. 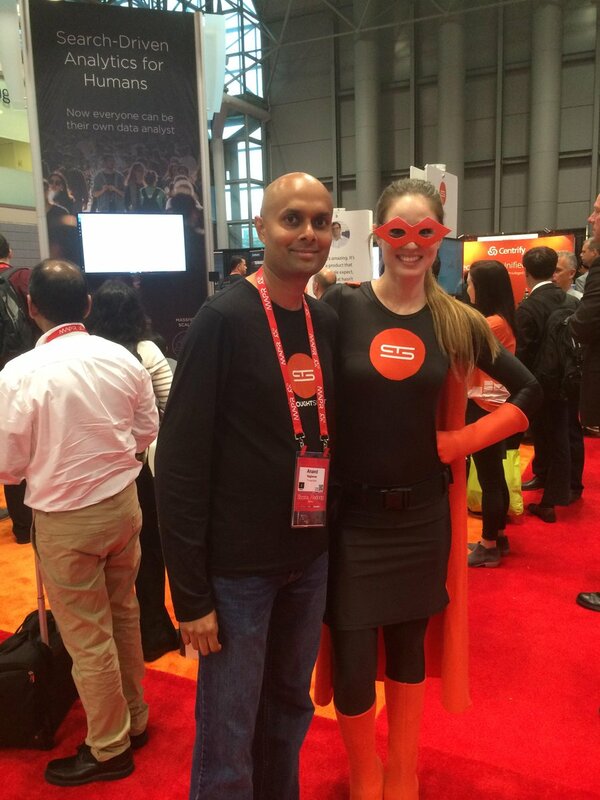 ThoughtSpot brought along a superhero. She was there mostly to communicate benefits messaging, but I’d like to believe she did some crime-fighting on her breaks. (We were in Gotham City, for goodness’ sake.) Other than a few leftovers from the Death Star, I didn’t see any super villains, so I suppose her work speaks for itself. Note to future Strata + HW planners: Maybe skip the DJ in the foyer next time. Loud. Really loud. Like just-entered-the-club loud. Next year, I’m serving snacks. Multiple booths set up espresso booths. (Those were the ones with the really jumpy staff.) There was plenty of candy, and Arcadia Data even offered (on-brand!) blue sno-cones.